Microsoft’s new Windows 10 platform has received quite a reception from bloggers and tech journalists. More importantly, it has been received with open arms by consumers eager to wipe Windows 8 from their desktops and laptops, and start fresh. People say that Windows 10 is amazing. Windows 10 is fantastic. Windows 10 is glorious. Windows 10 is faster, smoother and more user-friendly than any Windows operating system that has come before it. So apparently Windows 10 is everything Windows 8 should have been, addressing nearly all of the major problems users had with Microsoft’s previous-generation platform in one fell swoop. 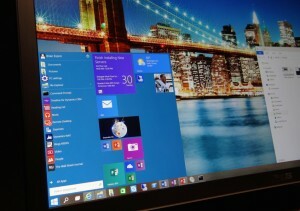 A fresh start is exactly what Windows 10 has given Microsoft, but it’s not all good news. While the new software is certainly a huge step in the right direction, some serious privacy concerns have been raised following the revelation that Windows 10 may be spying on almost everything you do. Microsoft has indeed played fast and loose with users’ privacy in Windows 10. By default, the new operating system is configured to track usage, and even to monitor your files and folders in some cases. Just look at how scary Microsoft’s privacy statement is. Features like this aren’t always a bad thing, but opting people in by default is hardly a user-friendly policy. Windows 10 is spying on nearly everything you do. And it’s your own fault if you don’t know that Windows 10 is spying on you. That’s what people always say when users fail to read through a company’s terms of service document, right? 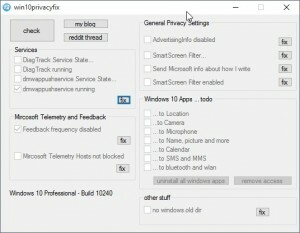 As invasive as it is, Microsoft does allow Windows 10 users to opt out of all of the features that might be considered invasions of privacy. Again, users are opted in by default, which is more than a little disconcerting specially for the average user. 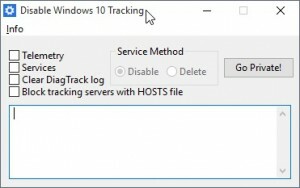 There are some online posts about a few things you can do to opt out of many of Microsoft’s tracking features in Windows 10. 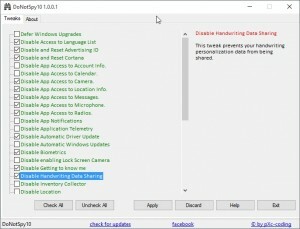 Since this is such a widely publicized issue, however, there are already plenty of tools you can use to help simplify the process of taking your privacy back in Windows 10. So what should be done ? First, you’ll want to open Settings and click on Privacy. There you’ll find 13 different screens — yes, 13 — to go through, and you’ll want to disable anything that seems worrying. The blog notes that most of the important settings can be found on the General tab, though other tabs are important as well. For example, you’ll definitely want to adjust what types of data each app on your system can access. Next, users should consider dumping Cortana. Yes, the voice-driven assistant is easily one of the best new features in Windows 10, but it also plays fast and loose with your data. As a result, many users will find that the benefits do not outweigh the risks. For the third task, you’ll have to venture outside the confines of your PC and hit the web. Perhaps this is a good opportunity to check out Microsoft’s nifty new Edge browser. In it, click on this link and set both “Personalised ads in this browser” and “Personalised ads wherever I use my Microsoft account” to off. This will disable Microsoft’s Google-style ad tracking features. The last tip is one that most users will likely forgo, as it is a bit excessive. Rock Paper Shotgun recommends removing your Microsoft account from Windows 10 completely and using a newly made local account instead. This way, Microsoft doesn’t grab hold of all your data to sync it across machines. To make it easier, below you’ll find six different apps covered, along with brief descriptions. Click on the name of any app to download it. 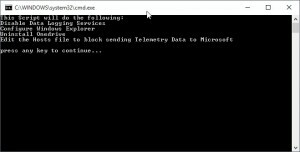 This app is similar in intent to Destroy Windows 10 Spying, but with only four options, its focus is far more narrow. 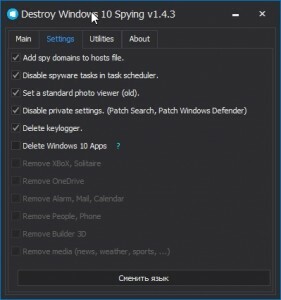 DoNotSpy10 is one of the most comprehensive options out there for taking control of your privacy in Windows 10. There’s a caveat, though: It’s freeware, but it installs Open Candy software on your PC, which will display ads automatically in other apps. This is just a simple batch file — check gHacks for details on how it works. Last, and unfortunately also least, is W10 Privacy. This app is one of the best options out there in terms of covering as many privacy settings as possible… originally only available in German, now it has been translated to English and several other languages.